ANAHEIM, California – At NAMM 2014 DigiTech is showcasing its Supernatural Ambient Reverb, offering seven studio-quality reverbs in a compact, easy to use pedal. From subtle sonic enhancement to lush reverb-plus-modulation effects, the Supernatural Ambient Reverb delivers an extraordinary selection of rich, ambient sounds. The Supernatural Ambient Reverb provides guitarists and musicians with a wide palette of reverb modes including Spring, Plate, Plate Mod, Shimmer, Supernova, Shine and Pherb. The pedal can be used in stereo or mono. For classic reverb enthusiasts, the Spring setting provides the most accurate reproduction of the lively sound of the spring reverb units used in classic and contemporary amplifiers (which run the signal through actual springs housed in a metal pan), exemplified in the surf music records of the early ‘60s and heard on thousands of recordings and live performances since. Plate delivers the sound of the vintage ‘60s studio units that fed the signal through large metal plates to get a uniquely complex reverb sound available by no other means – and still highly prized today. Plate Mod adds a layer of chorus to the effect. Shimmer is an upward cascading reverb that morphs into ethereal octave shifts. Shine provides thick reverb with lush chorus and a hint of pitch shifting. Supernova is an expansive reverb with spaced-out flanging and pitch shifting. Rounding out the effects selection, Pherb delivers the distinctive Lexicon® Hall reverb flavored with a taste of phasing. The Supernatural makes it easy to tweak any of the reverbs to perfection. The Mix knob blends the dry to effected signal in any proportion from 0 to 100 percent. The Liveliness control adjusts the amount of high-frequency response and the Delay knob adjusts the length of the reverb duration. A Tails On/Off switch located below the footswitch gives a choice of having the notes reverberate naturally after the effect is turned off, or shutting off the effect immediately after stepping on the footswitch. Two input and two output jacks give players the option of stereo or mono operation. Adding to its usability, the Supernatural comes with DigiTech’s hard rubber Stomplock™ attachments that fit over the controls to keep the player’s settings in place. 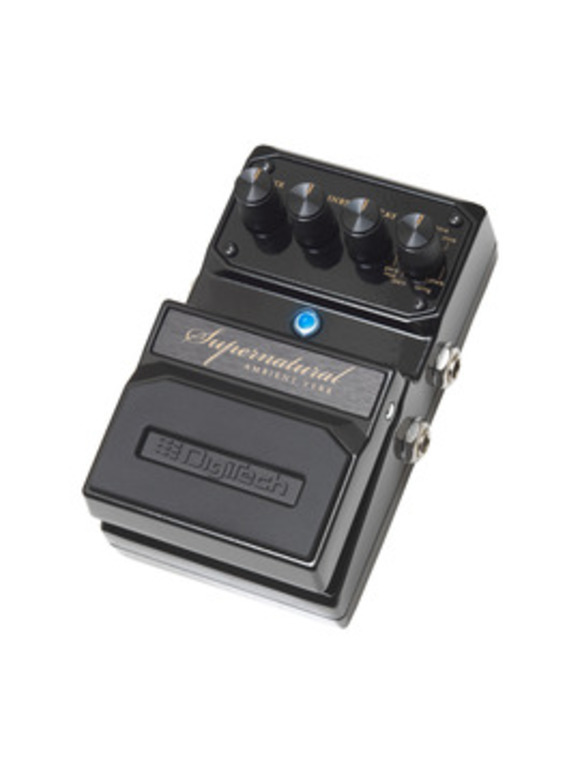 The DigiTech Supernatural Ambient Reverb will be available in March 2014 at a suggested retail price of $249.95.